Dezille Brothers are playing JZ Brat in Shibuya on Friday, August 24 with no opener. The juices have accumulated to the point of total saturation. The restless wait for release seems endless. Expect a great show. See Concert Information for details. Dezille Brothers, currently in the midst of production, will be appearing at an annual festival on Miyako Island in Okinawa. Enjoy the earthy music of Dezille while bathing in the blue of sea and sky. See Concert Information for more details. Dezille Brothers will be performing again at Daikanyama Loop in February 2012. We hope you can make it. Dezille Brothers make their first appearance at Shimokitazawa Garden on December 21, sharing the bill with Keyco, Coma-Chi and Goka. Enjoy a great show right before Christmas. Dezille Brothers will be making their first appearance at Daikanyama Loop in November. They will share the bill with Spinna B-Ill at a special event to commemorate the club's third anniversary. Advance ticket reservations now being taken. If you take Dezille Brothers stock and just extract Junpei Shiina and Tomoyasu Takeuchi, you wind up with the group Shiitake. Shiitake will be appearing at an event at Daikanyama Loop on January 31. Get your fill of hearty music and lively banter. Shiitake is a two-man unit made up of Dezille Brothers Junpei Shiina and Tomoyasu Takeuchi. When Dezille Brother Swing-O joins the mix, the unit is transformed into the New Shiitake. The New Shiitake plays the Plug in Shibuya on Wednesday, December 14. Don't miss it. Fish Market: To Fry or Not To Fry? "Shiitake," made up of Dezille Brothers Junpei Shiina and Tomoyasu Takeuchi, will perform at two concert events in October, on the 2nd and 20th. 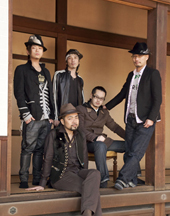 Dezille Brothers will appear at “JAPRIDE Vol. 1,” an event organized by guitarist Tomoyasu Takeuchi. The Brothers play Aoyama Cay on January 18 and Osaka Noon on January 20. Dezille Brothers Junpei Shiina and Swing-O will be participating in a live concert event on November 3 in Yokohama at the Korg booth at the Musical Instruments Fair. Take a ticket for your chance to see the show. Dezille Brothers will appear at a 9th anniversary event for Shibuya Plug. Reproducing or quoting any images or text used on this site is strictly prohibited. copyright (c) 2003- kronekodow all rights reserved.